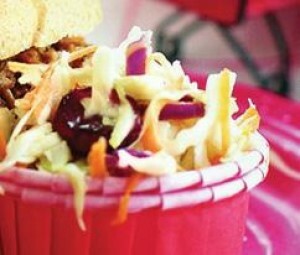 This colorful side salad is perfect with burgers, sandwiches, and grilled chicken, and if you’re planning a picnic with your family, it’s also an ideal thing to pack along. Made with light mayo instead of the full-fat kind and a few handfuls of dried cranberries, it’s a nutritious addition to any meal. SPECIAL OFFER: SchoolFamily.com readers can purchase No Whine With Dinner at 30 percent off the list price, and get free shipping, by ordering the book here and using this promo code: FS2011. In a large bowl, whisk together the mayonnaise, vinegar, maple syrup, and salt until creamy and smooth. Add the coleslaw and cranberries and toss gently until well blended. Serve right away or refrigerate and serve chilled.